Liriope muscari – Wholesale Growers. 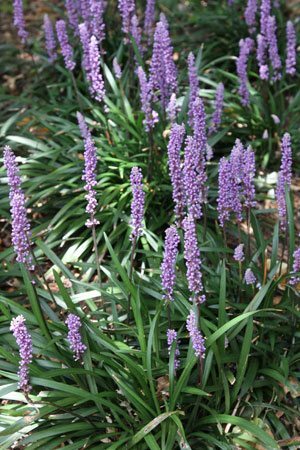 One of the more popular landscaping ornamental grasses Liriope muscari is available in a number of forms from wholesale growers. Used as a ground cover plant, border plant as well as for under planting larger plants in containers perhaps the best known is Liriope muscari ‘Evergreen giant’, also known as the ‘Giant Turf Lily’. Wholesalers offer a number of varieties suited to different landscaping uses. It can be used as a lawn substitute for no or low traffic areas. Used in this way once established it makes a low maintenance, ornamental lawn. Best used in light shade, Liriope muscari can be planted at around 30cm apart for a ground cover or lawn. Closer for a quicker result or if purchased as tubestock. Sun – Full sun to afternoon shade in hotter climates. Water – Drought tolerant once established, water well through first summer. Pruning – Can be pruned back in late winter to tidy up old foliage. Propagation – East bu division of older clumps. With many varieties offered by wholesalers these strap leafed grass like plants have a lot to offer landscapers. Weeping forms such as Liriope muscari ‘Emerald Cascade’ with fine weeping foliage are suited to growing as a border plant as well as in containers. L. Muscari ‘Royal Purple’ with its good mid to deep purple flowers will reach around 40cm and mass planted makes an excellent ground cover plant. L. muscari ‘Samantha’ will reach around 40 – 45cm in height, and is pink flowering. L. muscari ‘Amethyst reaches around 40cm and has deeper purple flowers than most. L. muscari ‘Isabella’ is lower growing to around 25cm in height. Fine foliage and a dense growth habit. Excellent as a ground cover plant.